With his gamble on Telangana-focused sub-nationalism paying off, KCR has finally decided to come clean on his plan to target goals beyond state borders. KCR's emphasis on "Telangana pride" made him a darling of the masses. 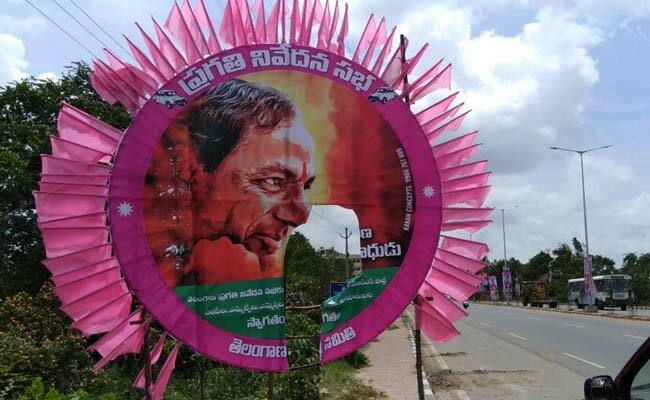 K Chandrasekhar Rao's Telangana Rashtra Samithi (TRS) rode on the twin vehicles of Telangana pride and pro-public welfare schemes to achieve a landslide victory in the state assembly elections, the results for which were declared on Tuesday. The positive showing in the polls also gave a major impetus to the party's aspiration of playing a bigger role in national politics in the years to come. The TRS seemed set to win nearly 90 seats in the 119-member state assembly by 7:15 pm, beating all expectations and pre-poll surveys. An aggregate of opinion polls released on October 9 had showed the party emerging victorious in 85 seats. Now, with his gamble on Telangana-focused sub-nationalism paying off, Mr Rao has finally decided to come clean on his plan to target goals beyond state borders. "The country needs a new economic model with agriculture as its basis. It's sad that although we are a farming country, we only think of production instead of productivity," he claimed at a press conference held this evening, giving an indication that he will be taking the national stage on the agricultural plank. "There are 15 crore farmers in the country who are still suffering," the Telangana Chief Minister said, adding that he will be "heading to Delhi" soon. Mr Rao announced that he will start playing a bigger role in national politics with Hyderabad as his base. "We are going to unite the polity of India. This country needs to rise above this routine bickering between the BJP and Congress," he said. He made light of the Congress' good showing in Rajasthan, Madhya Pradesh and Chhattisgarh, saying that they had simply emerged lucky because the people couldn't find a viable alternative to the ruling party. The BJP also came in for criticism from the veteran leader for bringing up issues like the Ram temple and surgical strikes during the election season. A major factor that seemed to have worked in the party's favour is Mr Rao's decision to call for early elections while he still enjoyed the people's goodwill. Even the decision of the opposition Congress to ally with long-time rival Telugu Desam Party couldn't dent the TRS juggernaut, with the latter making Telangana pride a key issue in its campaign.